Welcome back! 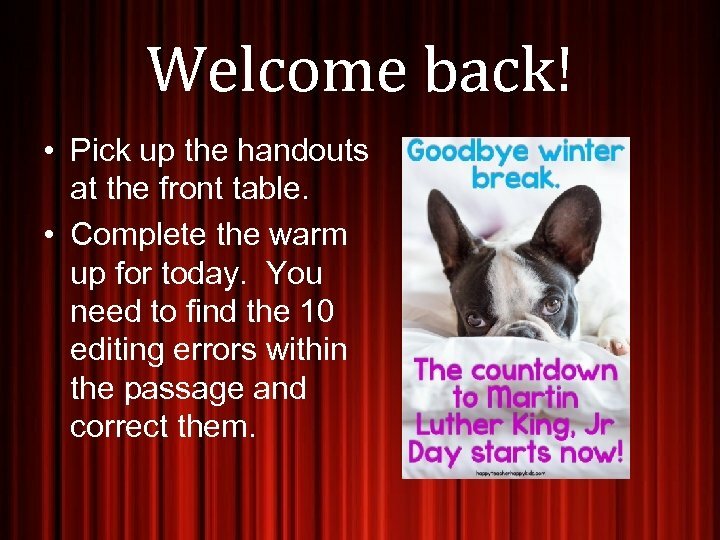 • Pick up the handouts at the front table. • Complete the warm up for today. You need to find the 10 editing errors within the passage and correct them. 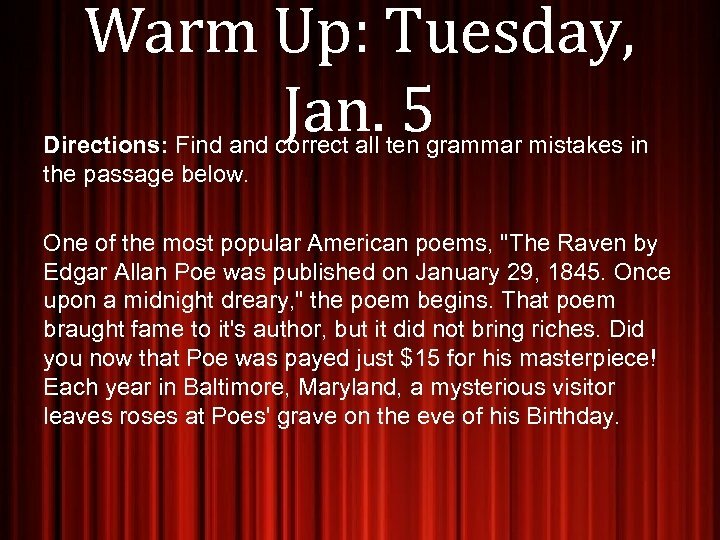 Warm Up: Tuesday, Jan. 5 Directions: Find and correct all ten grammar mistakes in the passage below. One of the most popular American poems, "The Raven by Edgar Allan Poe was published on January 29, 1845. Once upon a midnight dreary, " the poem begins. That poem braught fame to it's author, but it did not bring riches. Did you now that Poe was payed just $15 for his masterpiece! Each year in Baltimore, Maryland, a mysterious visitor leaves roses at Poes' grave on the eve of his Birthday. 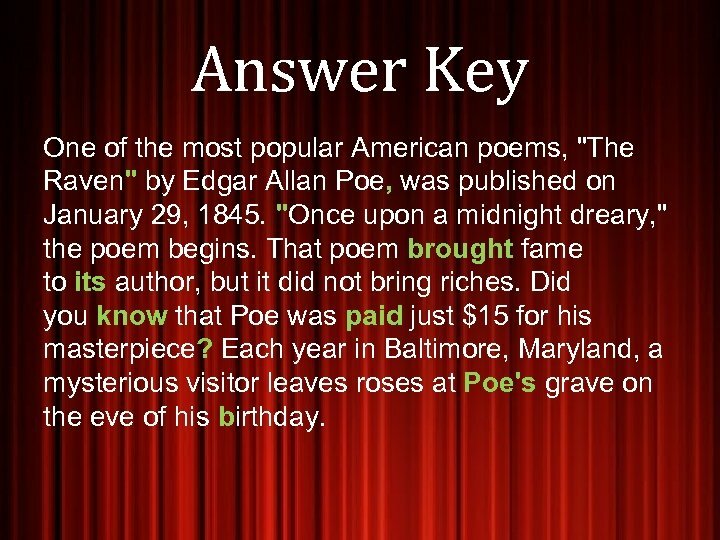 Answer Key One of the most popular American poems, "The Raven" by Edgar Allan Poe, was published on January 29, 1845. "Once upon a midnight dreary, " the poem begins. That poem brought fame to its author, but it did not bring riches. Did you know that Poe was paid just $15 for his masterpiece? Each year in Baltimore, Maryland, a mysterious visitor leaves roses at Poe's grave on the eve of his birthday. 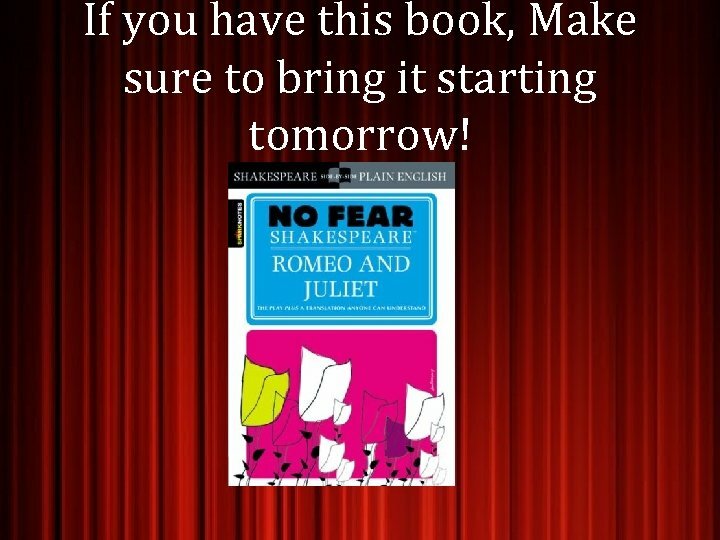 If you have this book, Make sure to bring it starting tomorrow! 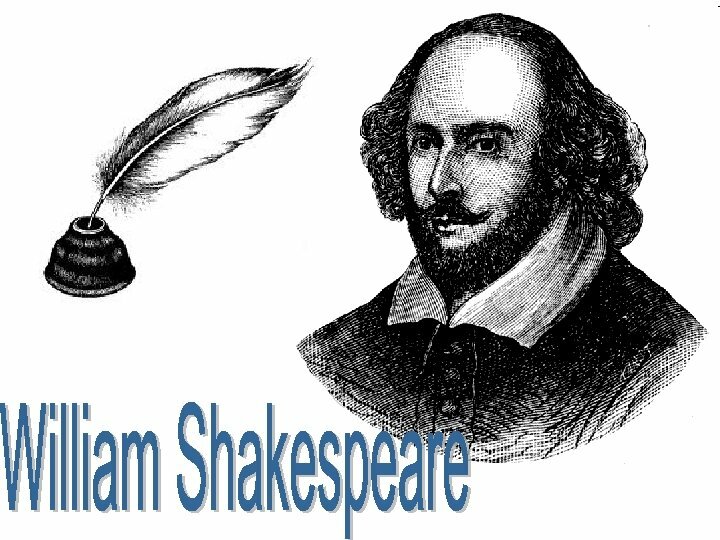 William Shakespeare Biography Ø William Shakespeare was born on April 23 rd, 1564 in Stratford on Avon in England. 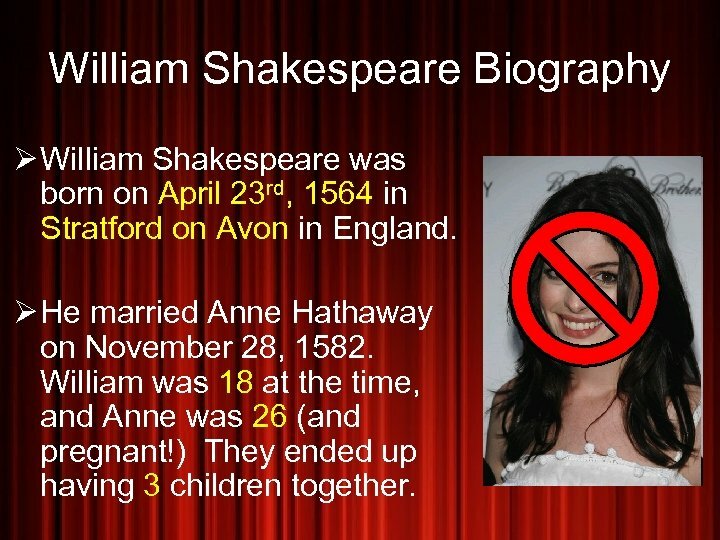 Ø He married Anne Hathaway on November 28, 1582. William was 18 at the time, and Anne was 26 (and pregnant!) They ended up having 3 children together. Life in the Theater Ø By 1594, he was acting and writing for the Lord Chamberlin’s Men, a theater troop in London. 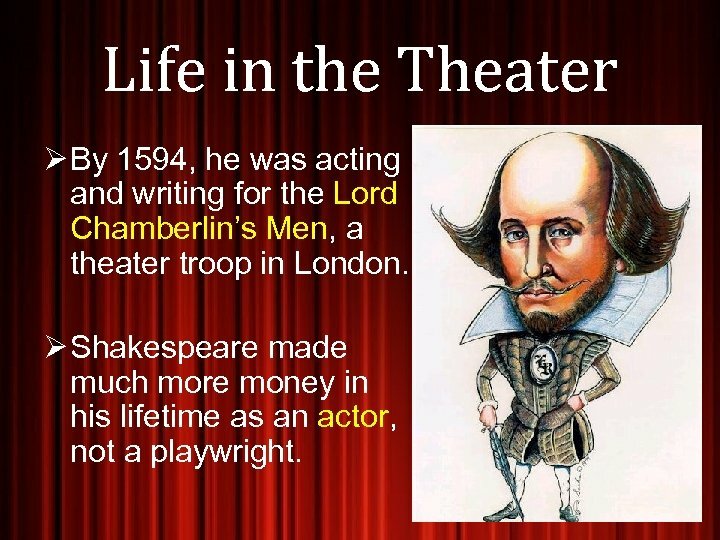 Ø Shakespeare made much more money in his lifetime as an actor, not a playwright. 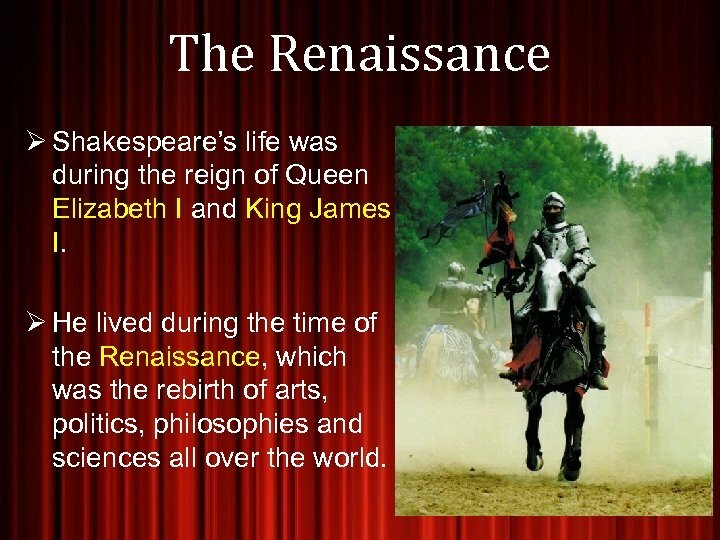 The Renaissance Ø Shakespeare’s life was during the reign of Queen Elizabeth I and King James I. Ø He lived during the time of the Renaissance, which was the rebirth of arts, politics, philosophies and sciences all over the world. 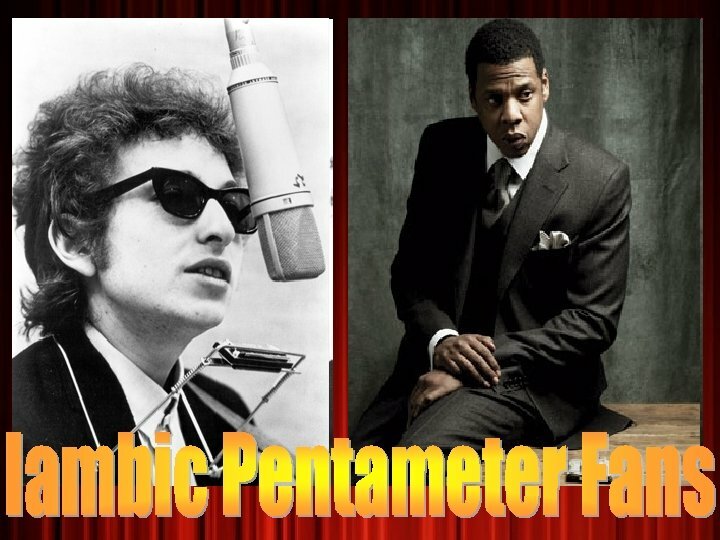 Shakespeare’s Writing Style Ø Shakespeare wrote in a poetic format called iambic pentameter. 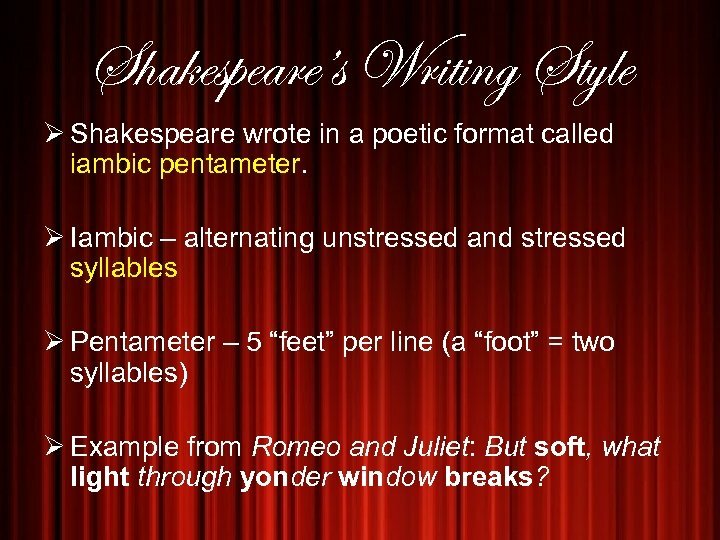 Ø Iambic – alternating unstressed and stressed syllables Ø Pentameter – 5 “feet” per line (a “foot” = two syllables) Ø Example from Romeo and Juliet: But soft, what light through yonder window breaks? 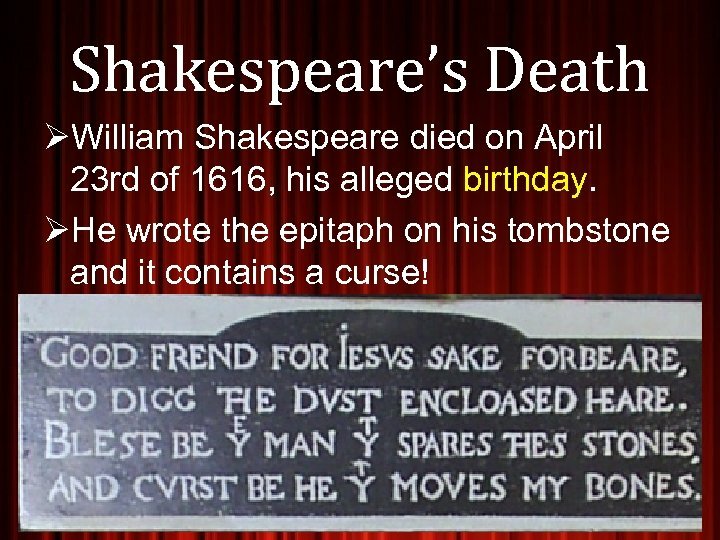 Shakespeare’s Death ØWilliam Shakespeare died on April 23 rd of 1616, his alleged birthday. ØHe wrote the epitaph on his tombstone and it contains a curse! 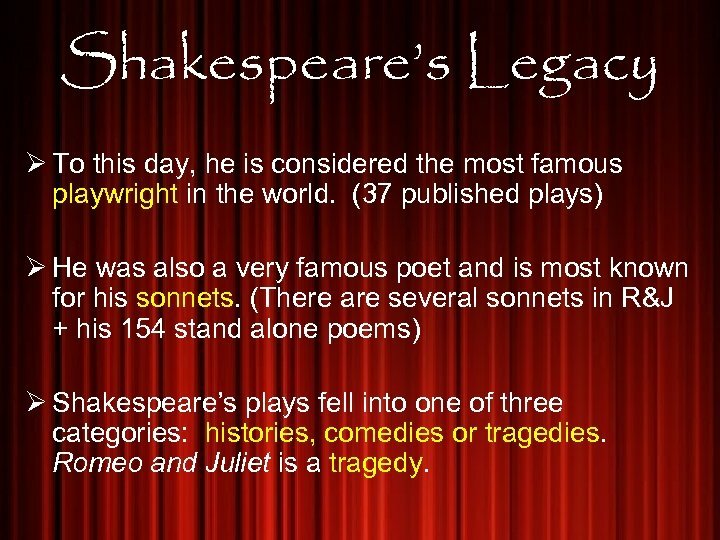 Shakespeare’s Legacy Ø To this day, he is considered the most famous playwright in the world. 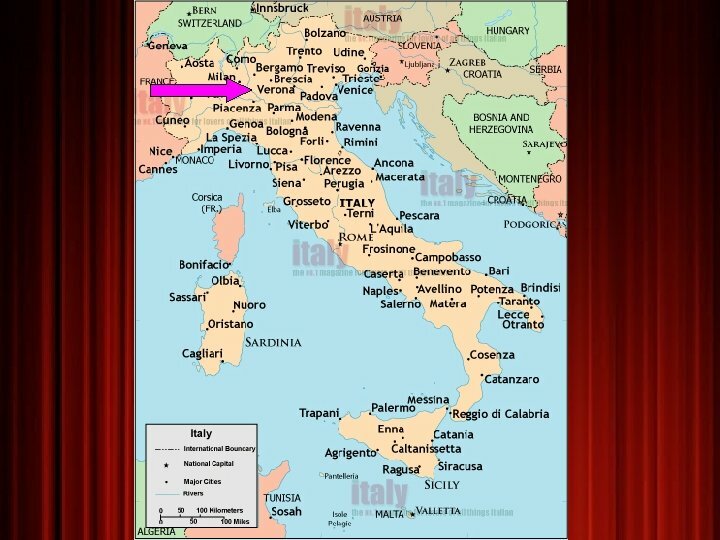 (37 published plays) Ø He was also a very famous poet and is most known for his sonnets. 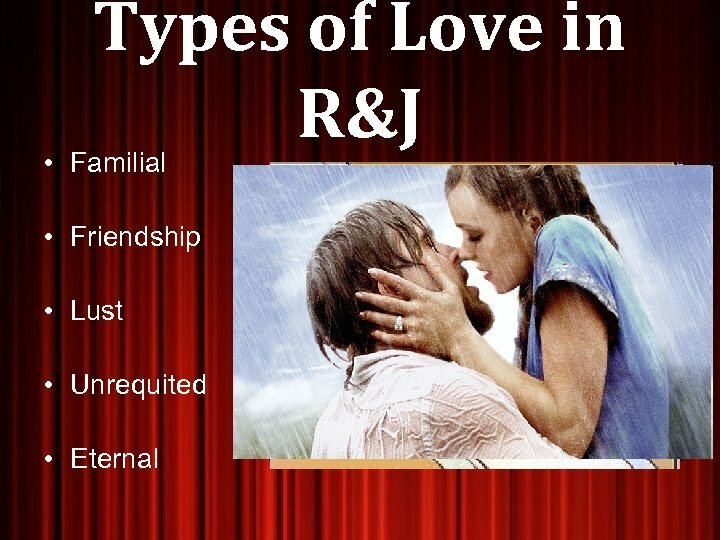 (There are several sonnets in R&J + his 154 stand alone poems) Ø Shakespeare’s plays fell into one of three categories: histories, comedies or tragedies. 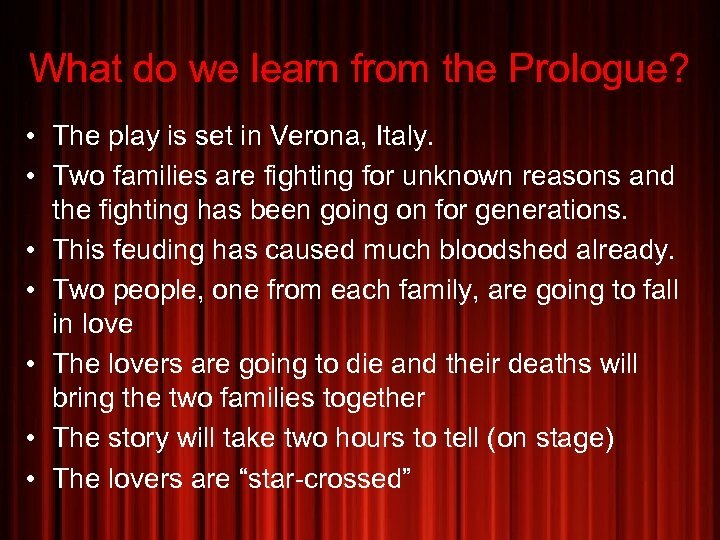 Romeo and Juliet is a tragedy. 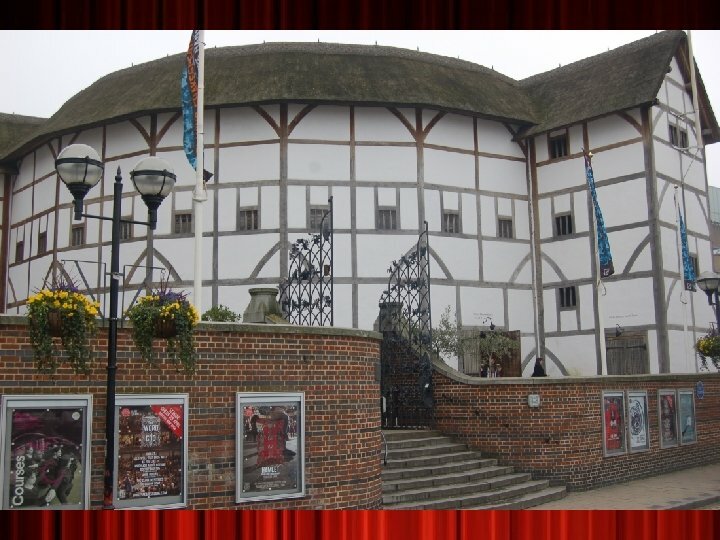 Ø The Globe Theater was built in 1599 by the Lord Chamberlin’s Men, Shakespeare’s acting company. Ø It was also known as the “Wooden O” due its shape. 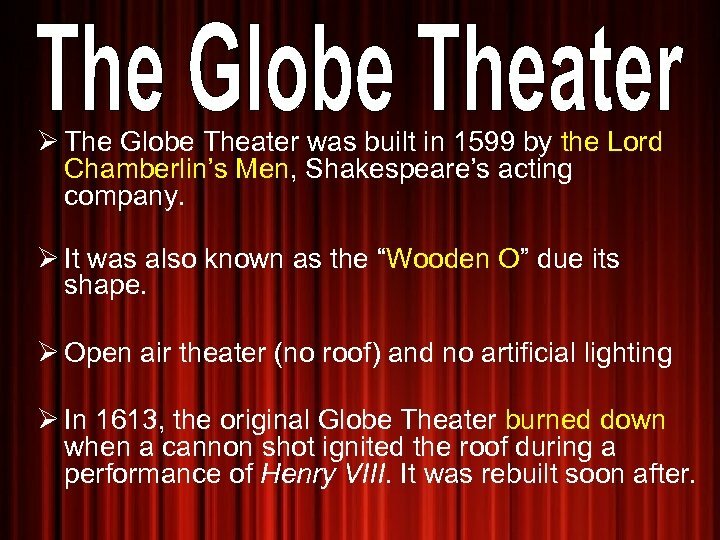 Ø Open air theater (no roof) and no artificial lighting Ø In 1613, the original Globe Theater burned down when a cannon shot ignited the roof during a performance of Henry VIII. It was rebuilt soon after. 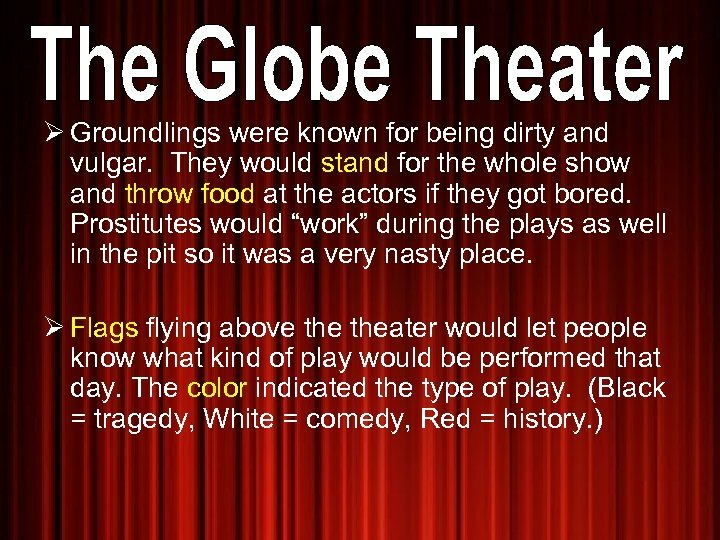 Ø The Globe was 3 stories tall and could house roughly 3000 people. 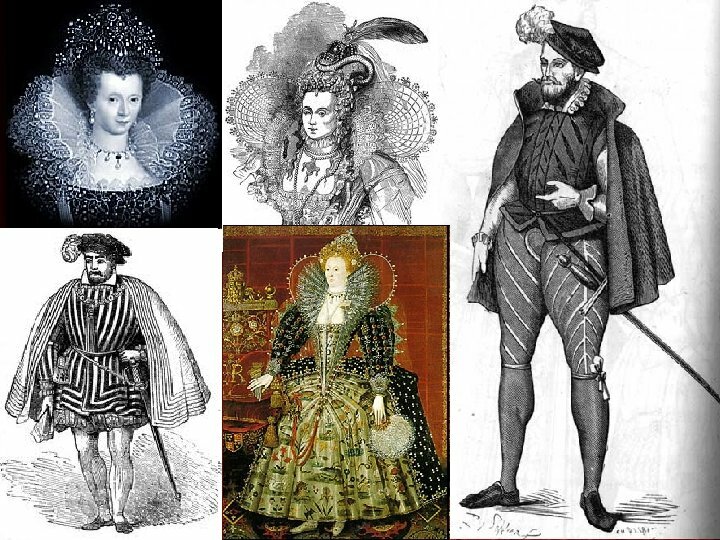 Ø Queen Elizabeth and King James I would frequent theater along with many of the rich elite in London. 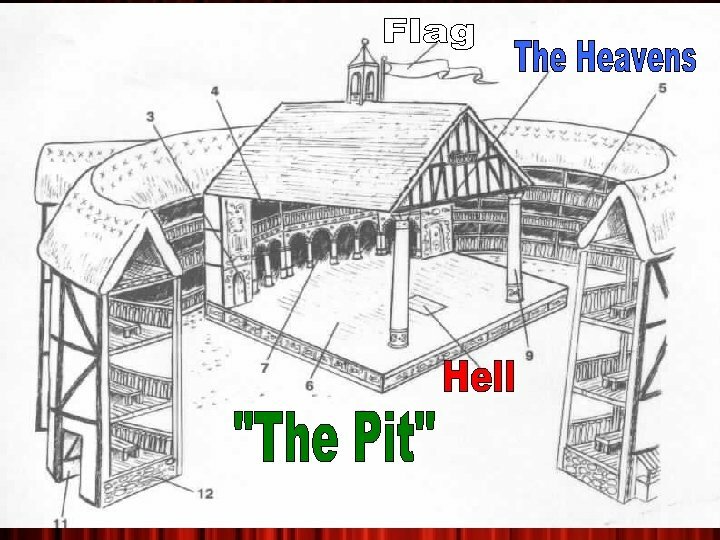 Ø On the other hand, at the base of the stage, there was an area called the pit, where, for a penny common people (the “Groundlings”) would stand to watch the performance. 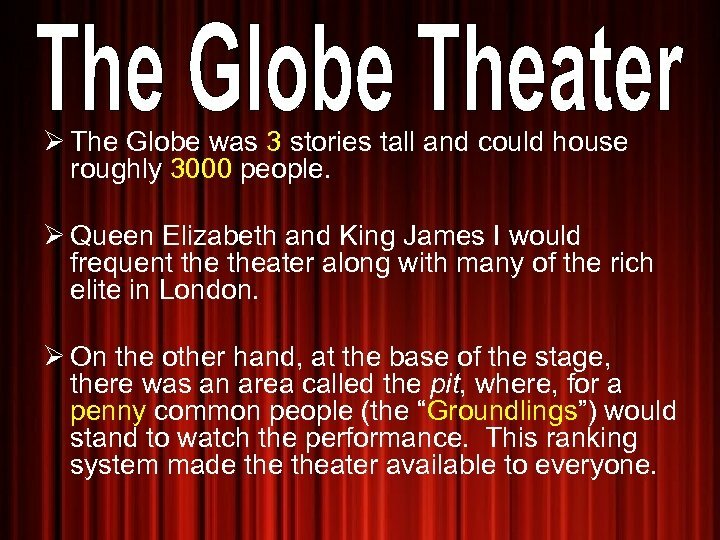 This ranking system made theater available to everyone. 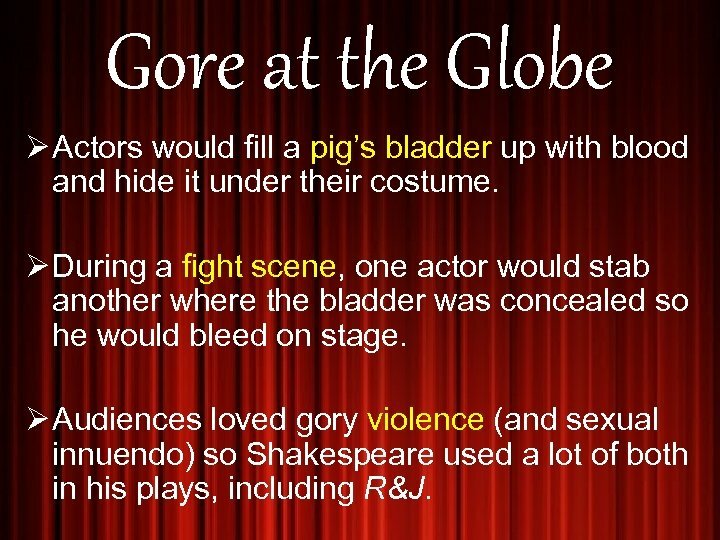 Gore at the Globe Ø Actors would fill a pig’s bladder up with blood and hide it under their costume. Ø During a fight scene, one actor would stab another where the bladder was concealed so he would bleed on stage. 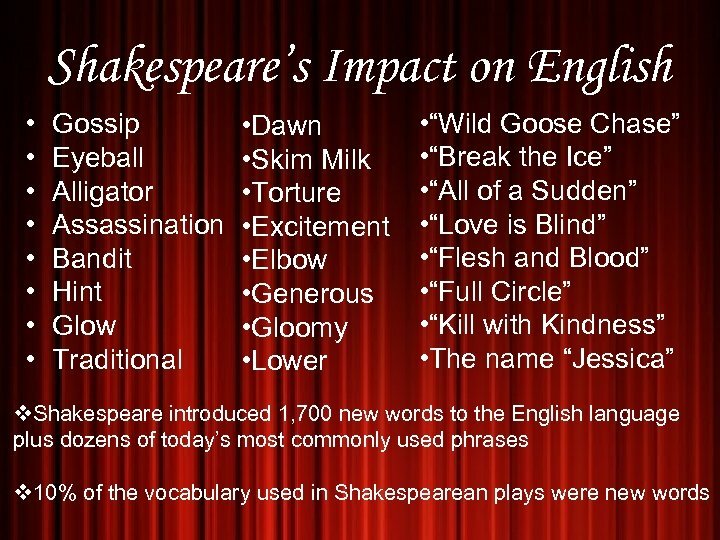 Ø Audiences loved gory violence (and sexual innuendo) so Shakespeare used a lot of both in his plays, including R&J. 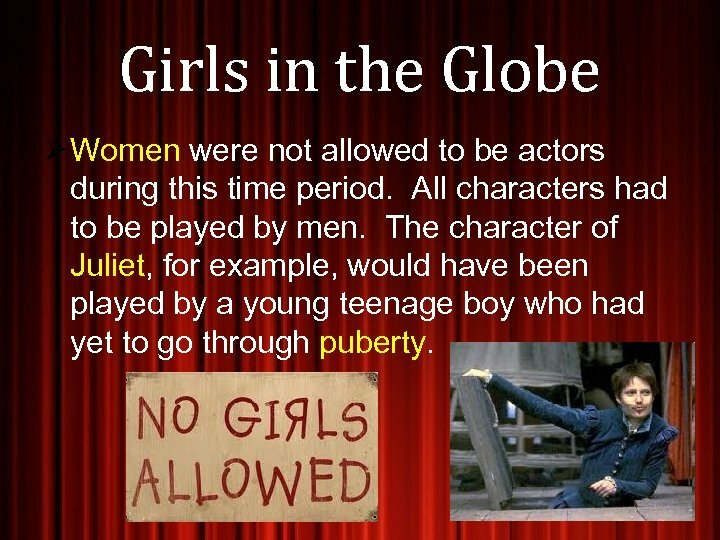 Girls in the Globe Ø Women were not allowed to be actors during this time period. All characters had to be played by men. 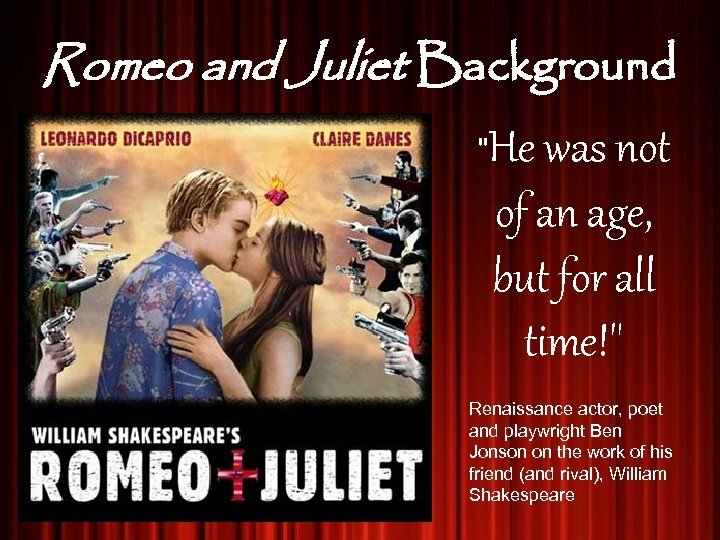 The character of Juliet, for example, would have been played by a young teenage boy who had yet to go through puberty. sets and props Ø Stage sets were very minimal. 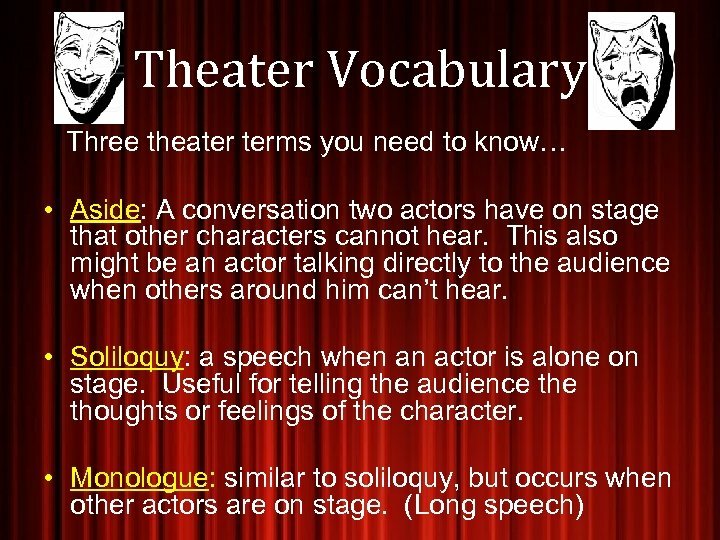 Actors and playwrights relied on words to set the time period, the location or the time of day that a scene would be taking place. 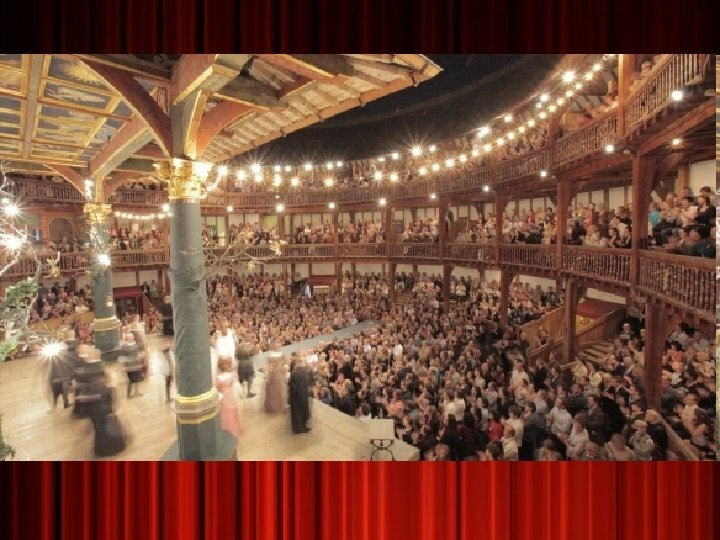 Ø Shakespeare used a narrator, called the chorus to also fill in any holes that audience members needed about time, location, or plot. 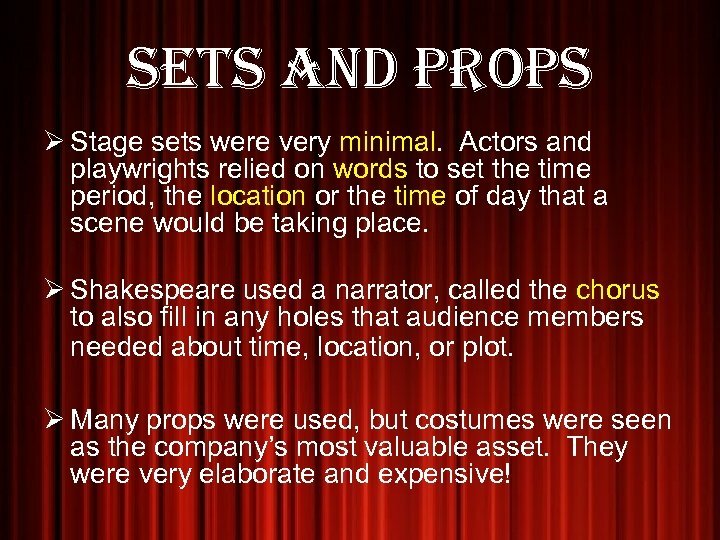 Ø Many props were used, but costumes were seen as the company’s most valuable asset. They were very elaborate and expensive! 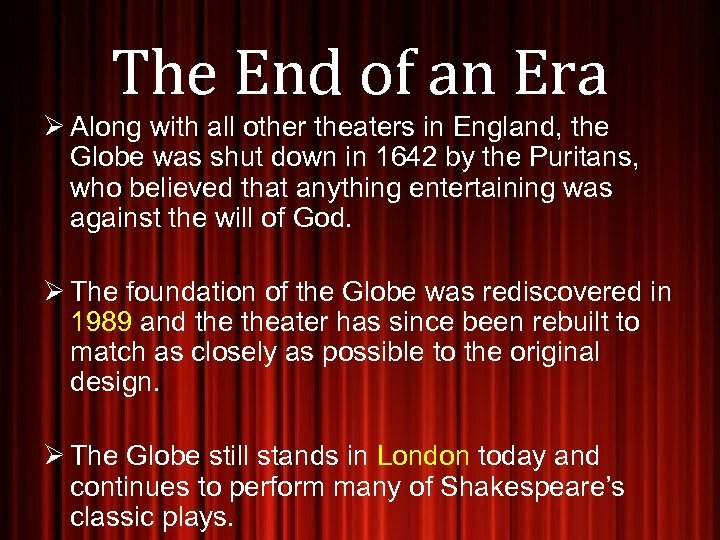 The End of an Era Ø Along with all other theaters in England, the Globe was shut down in 1642 by the Puritans, who believed that anything entertaining was against the will of God. 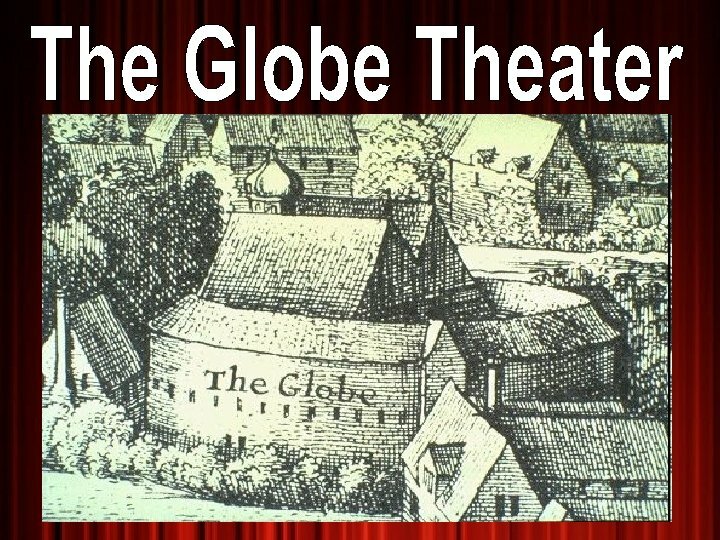 Ø The foundation of the Globe was rediscovered in 1989 and theater has since been rebuilt to match as closely as possible to the original design. 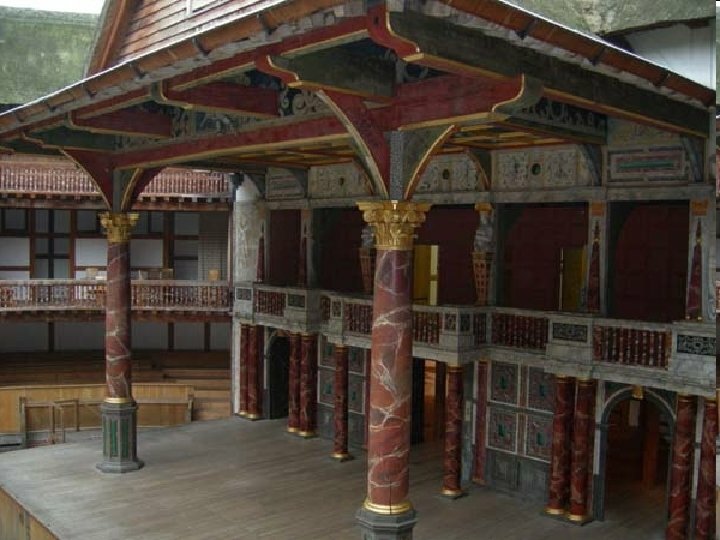 Ø The Globe still stands in London today and continues to perform many of Shakespeare’s classic plays. 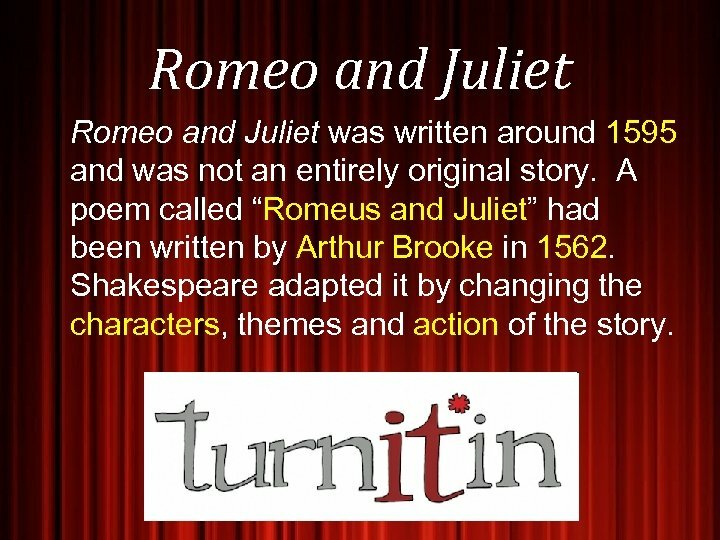 Romeo and Juliet was written around 1595 and was not an entirely original story. 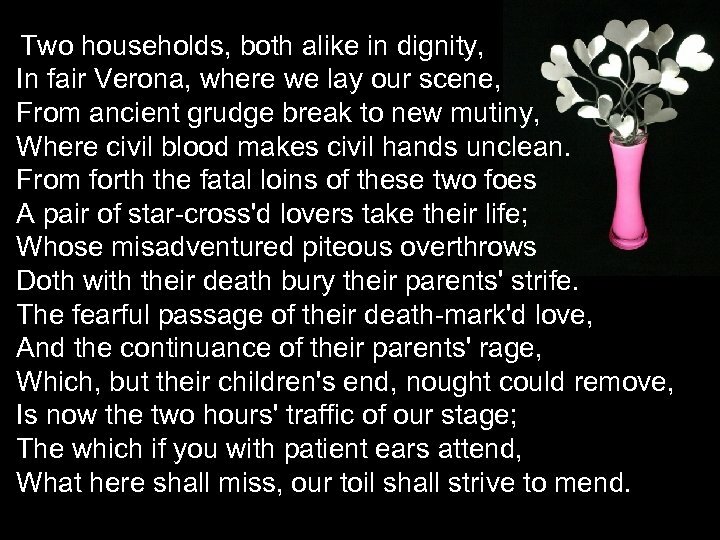 A poem called “Romeus and Juliet” had been written by Arthur Brooke in 1562. 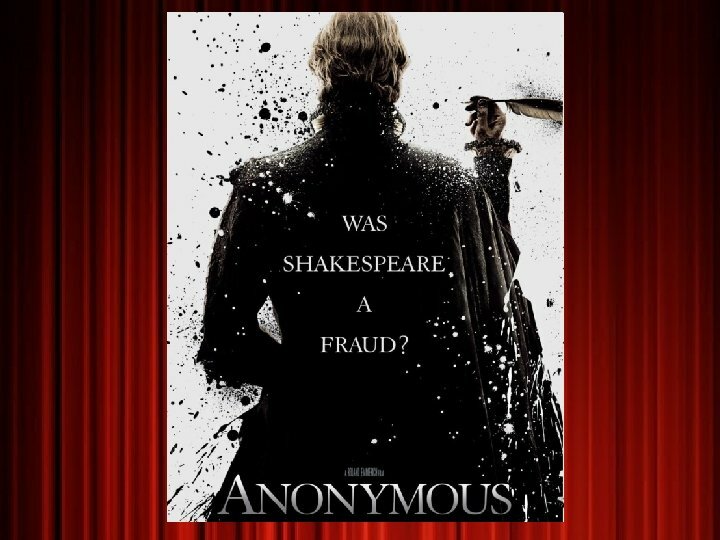 Shakespeare adapted it by changing the characters, themes and action of the story. 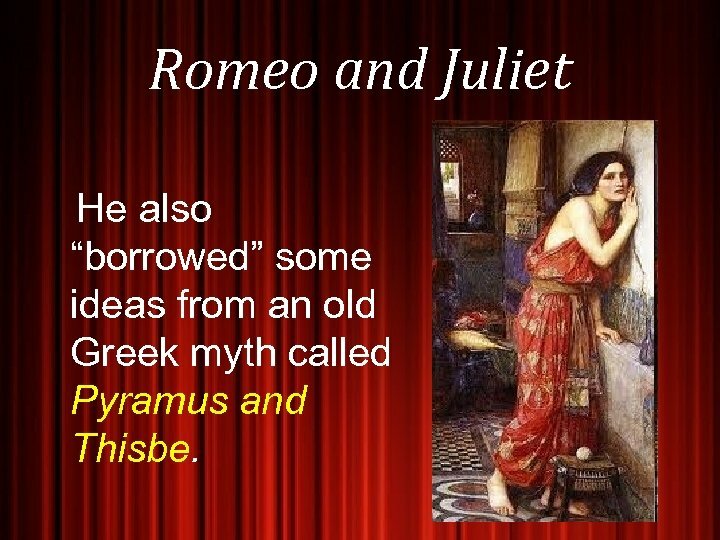 Romeo and Juliet He also “borrowed” some ideas from an old Greek myth called Pyramus and Thisbe. 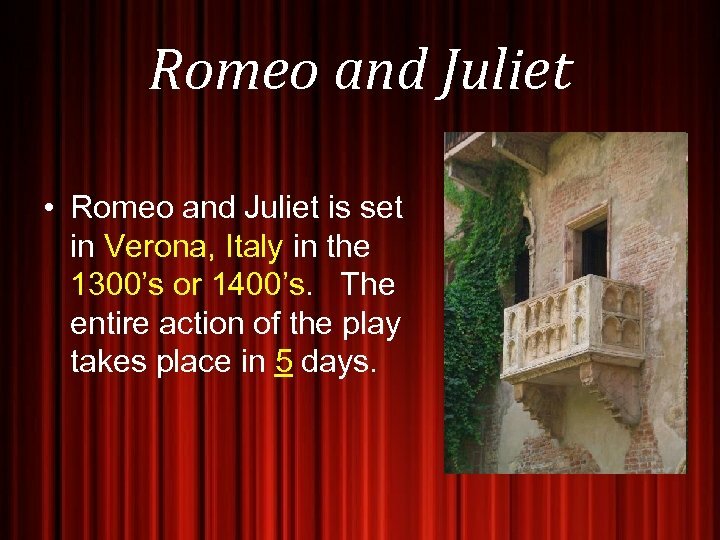 Romeo and Juliet • Romeo and Juliet is set in Verona, Italy in the 1300’s or 1400’s. The entire action of the play takes place in 5 days. 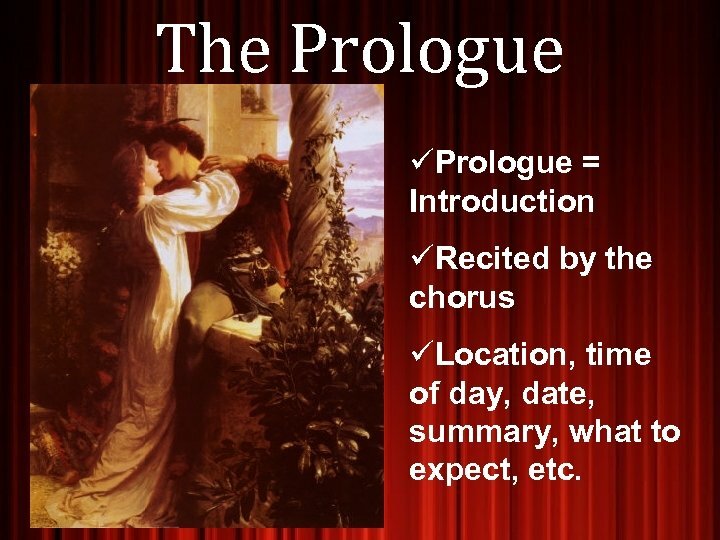 The Prologue üPrologue = Introduction üRecited by the chorus üLocation, time of day, date, summary, what to expect, etc. Two households, both alike in dignity, In fair Verona, where we lay our scene, From ancient grudge break to new mutiny, Where civil blood makes civil hands unclean. 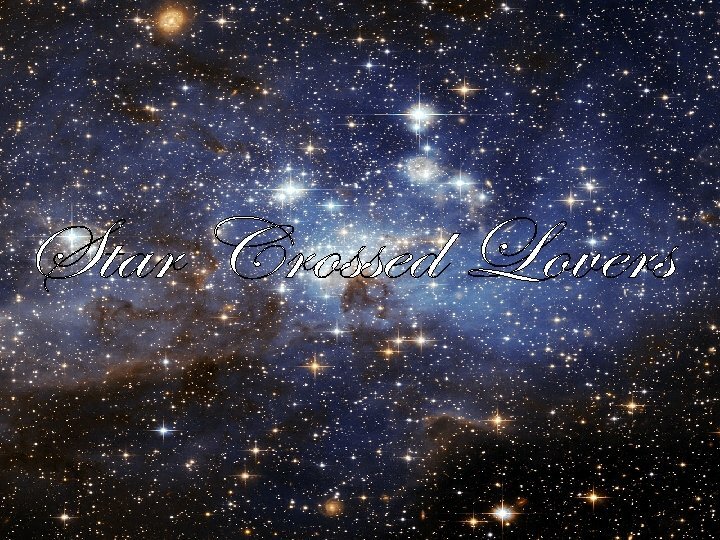 From forth the fatal loins of these two foes A pair of star-cross'd lovers take their life; Whose misadventured piteous overthrows Doth with their death bury their parents' strife. The fearful passage of their death-mark'd love, And the continuance of their parents' rage, Which, but their children's end, nought could remove, Is now the two hours' traffic of our stage; The which if you with patient ears attend, What here shall miss, our toil shall strive to mend. 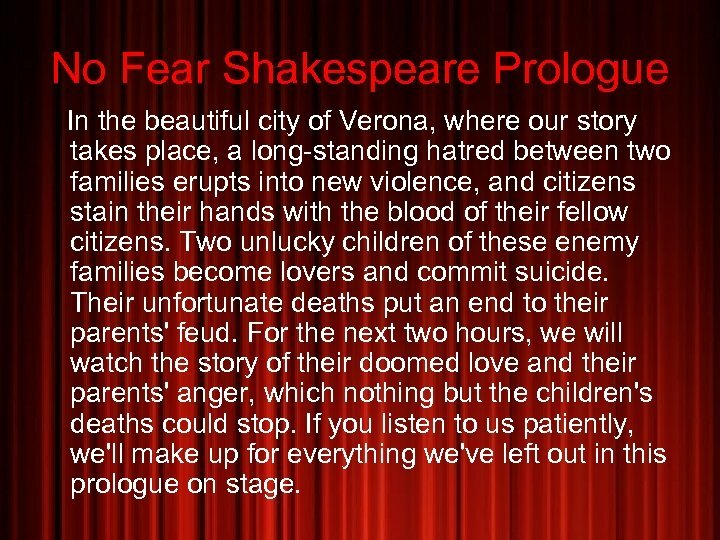 No Fear Shakespeare Prologue In the beautiful city of Verona, where our story takes place, a long-standing hatred between two families erupts into new violence, and citizens stain their hands with the blood of their fellow citizens. Two unlucky children of these enemy families become lovers and commit suicide. Their unfortunate deaths put an end to their parents' feud. For the next two hours, we will watch the story of their doomed love and their parents' anger, which nothing but the children's deaths could stop. If you listen to us patiently, we'll make up for everything we've left out in this prologue on stage. 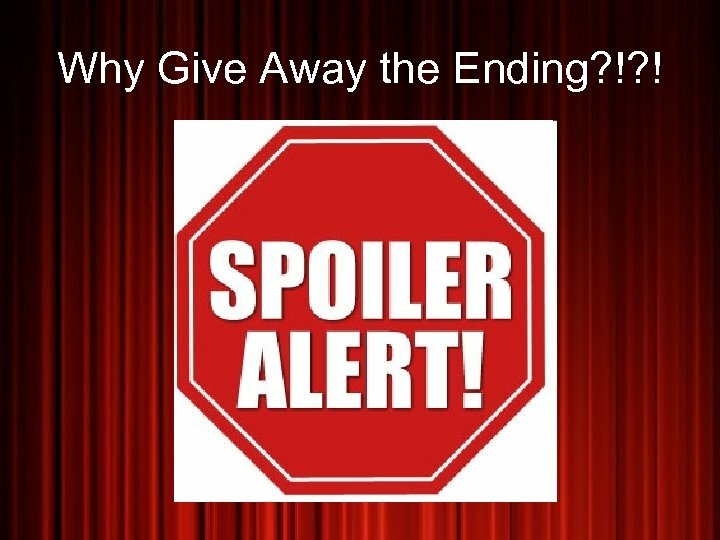 Why Give Away the Ending? !? !